Humans have been modifying their bodies throughout history. Tattoos, brands, piercings, implants, and even haircuts are just a few of the body mods that are out there. 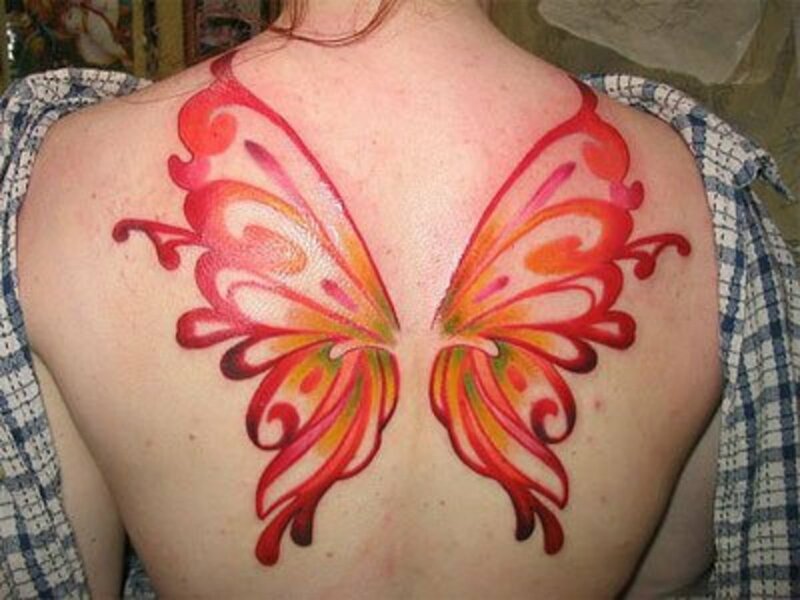 This being said, some body mods are more permanent than others. Here I would like to shine some light on the body art form of the stretching or gauging of piercings. Have you ever been walking around in public and noticed a person with irregularly large sized holes in their earlobes, lips, septum, or even tongue, and wondered to yourself, "What the hell are those crazy things?" Often decorated with large pieces of jewelry, these large stretched out piercings are known as gauges. 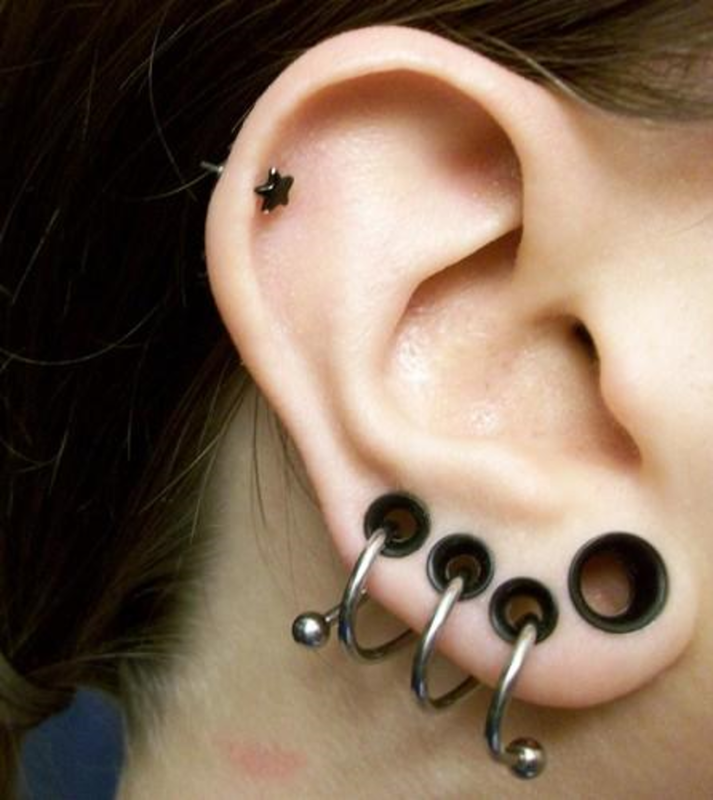 The sizes of the holes or piercings can be measured in gauge sizes. These measurements range from a 20 gauge (very small) and count down to a 00 gauge (much larger). The limits of how far one can stretch their piercings depends on the individual and the area that is being stretched. Some ear lobe and and lip piercings have been gauged as large as several inches. 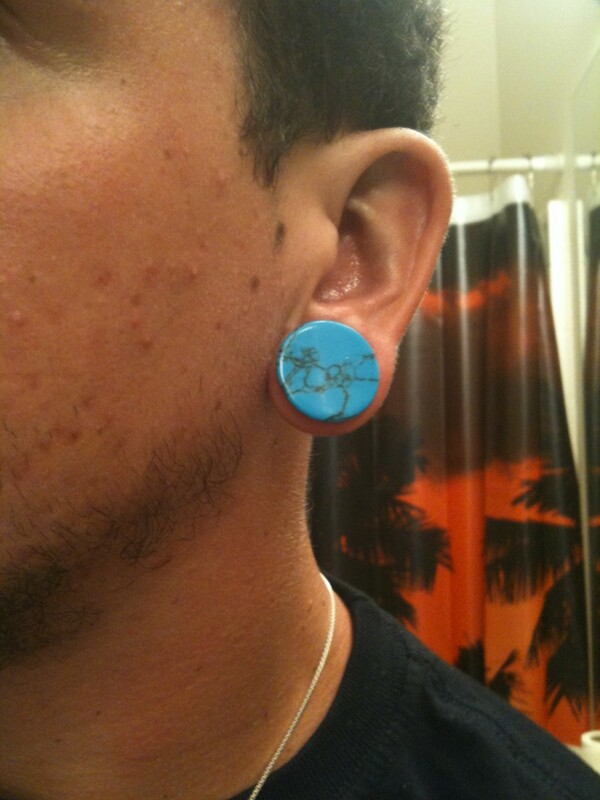 This is a gauged earlobe that has been stretched with a black acrylic tapper. Flesh Tunnels: Tunnels or flesh tunnels are a hollowed out gauge style that expose your piercing and allow you to see directly through it. Some flesh tunnels flare out on the ends, this keeps them from falling out of your ear. Other tunnels may use rubber or silicone O-rings or threaded stoppers for the same purpose. Plugs: Solid pieces of body jewelry that are used to pug up your piercing and stop it from shrinking. 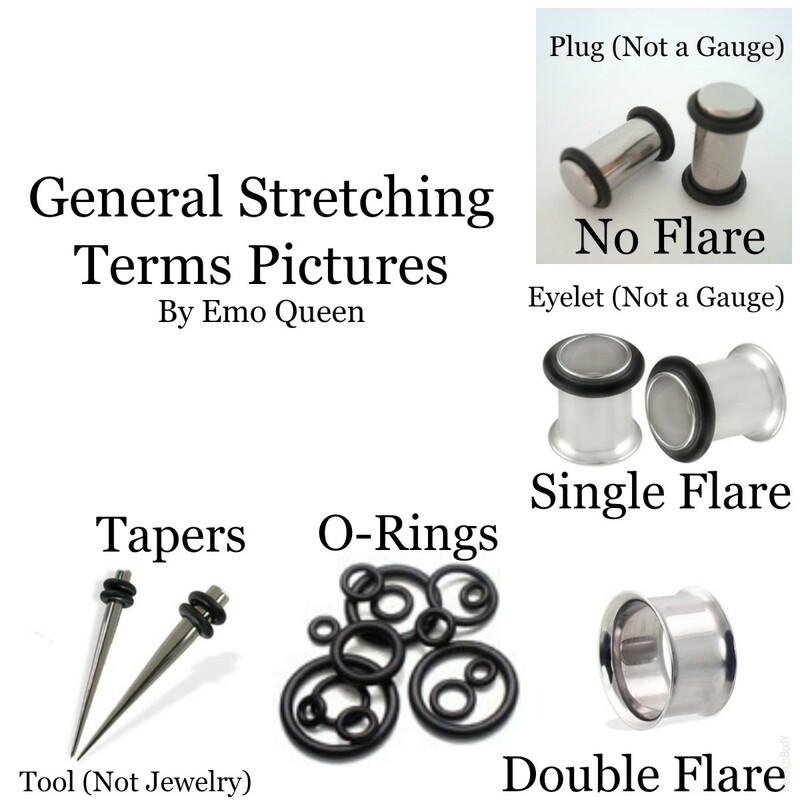 Like Flesh Tunnels, Plugs are often held in place by Flared ends, O-Rings or other forms of stoppers. Captives: This style of jewelry often comes in a circular or crescent shape. Captives are held in place by a ball or two balls that are either threaded on or simply held captive by the ends of the jewelry. 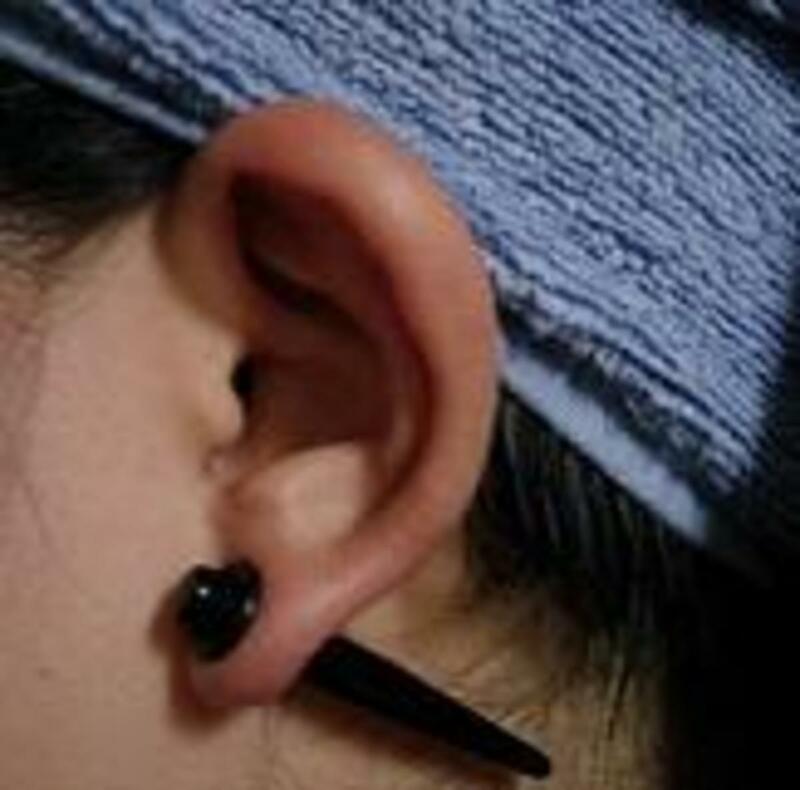 Tapers: Even though tappers are used for stretching the piercing itself, many people sport them after the stretching has healed because they like the style or shape of the taper. These are just some of the standard gauges that you may encounter. With a little bit of creativity, the possibilities are endless. Ive seen people make plugs out of pen caps, chicken bones, and even cigarette filters. Where the Hell Did These Things Come From? 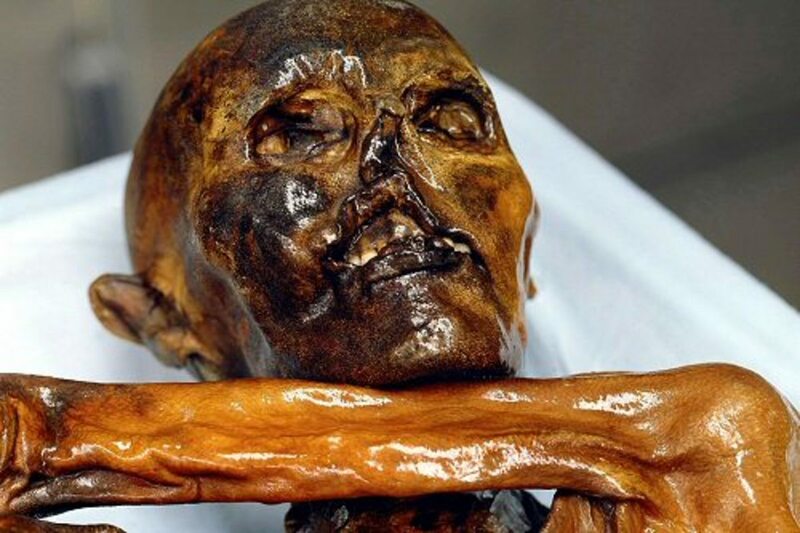 Otzi the Iceman: Otzi is the oldest recorded primitive mummy to have had stretched earlobes. It is estimated that Otzi was alive some time around 3300 B.C! His earlobes had been stretched to approximately 11mm. 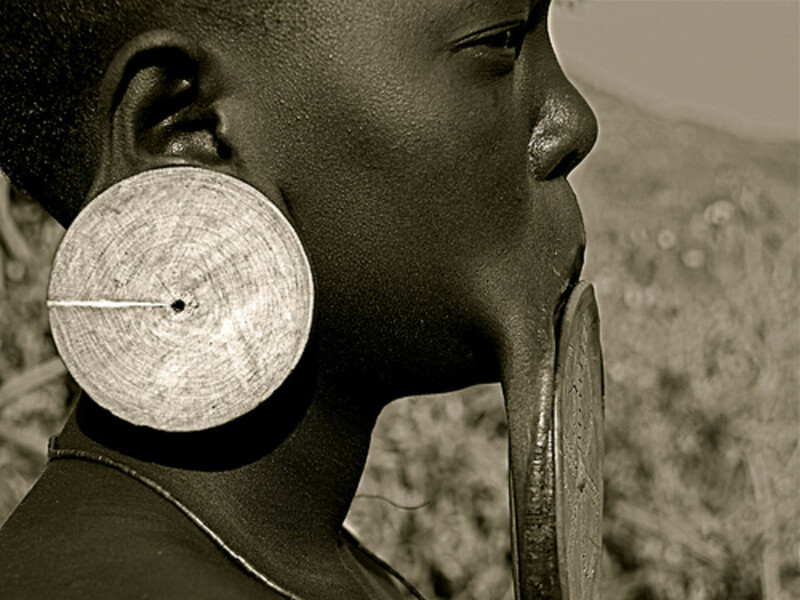 Many African tribes throughout history have practiced gauging in the areas of the lips and the earlobes. The women of the Mursi tribe, for example, have their lips cut open at a young age. Once cut open, the women begin the process of stretching. When the holes are stretched to an appropriate size, The women insert clay or wooden plates into the holes. This is a symbol of their womanly strength and beauty as an individual in the tribe. Ear gauging has also been a common practice amongst the African tribes. Both men and women of the Masai tribe in Kenya wear jewelry made of ivory, wood and thorns in their gauged earlobes to depict their beauty, power and spirituality. The woman of the Fulani tribe wear a very unique type of golden gauge. The size of the piercing itself is relatively smaller than that of other tribes.The size and shape of the jewelry that these women wear is what makes them unique. These earrings have a large golden pendent like center that is connected to the ear with a large circular hoop. Jade ear plugs very similar to what the Mayans would have worn. 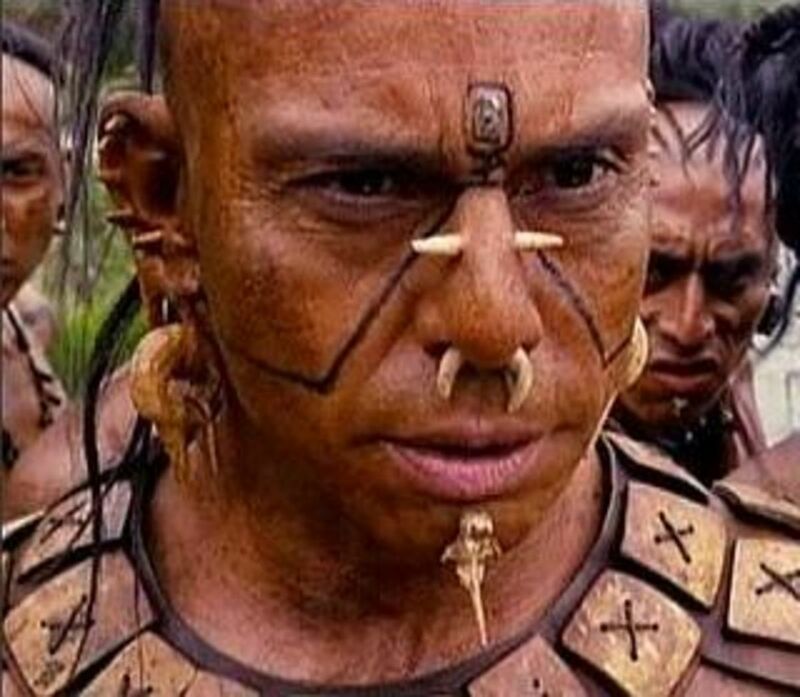 Aztecs and Mayans of Mexico: These Central American tribes wore large diametered ear plugs or flesh tunnels as a sign of wealth or social status. The Mayans typically used jade as a material to fashion their ear jewelry whereas the Aztecs crafted theirs out of gold, silver and copper. A depiction of "the Enlightened One" with gauged earlobes. Tribes in Thailand, such as the Lahu, practice stretching their earlobes with heavy pieces of jewelry. Other forms of gauging can be seen all across Asia in various cultures inhabiting regions including Japan, Myanmar and India. 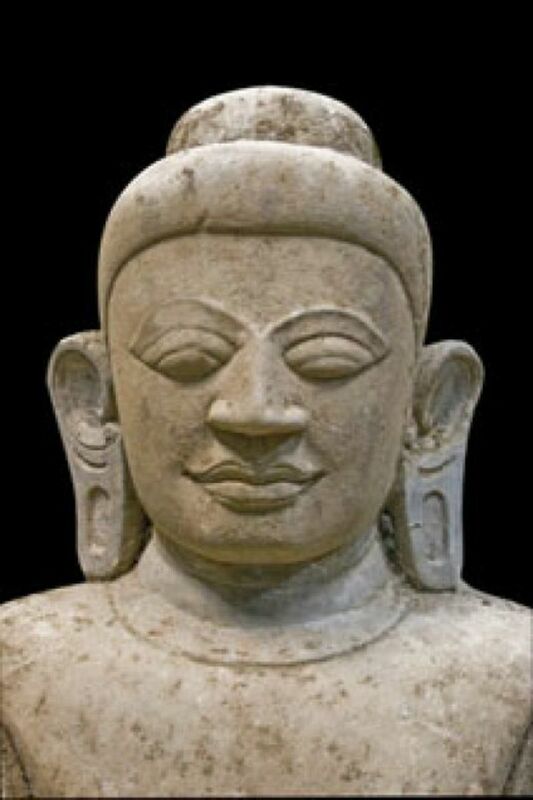 Many even believe that the Enlightened Gauatama Buddah had gauged earlobes that came from wearing heavy jewelry in the early wealthy stages of his life. King Tut is an exellent example of Egyptian ear stretching. This Egyptian Pharaoh began his reign in 1332 B.C. The golden mask of his Sarcophagus reveals stretched holes in his earlobes. It is said that the youth of Egypt had gauges in their ears until they reached the age of full maturity. 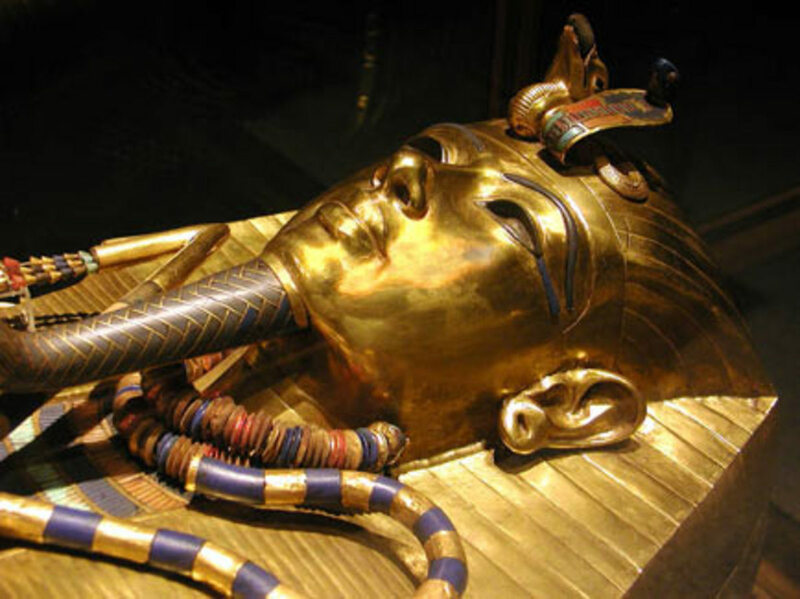 King Tut died at a young age which would explain the reason that he is depicted with ear gauges. The septum (the thick flesh between the nostrils) has been pierced and stretched throughout various cultures across the globe. This practice is was common in Native American medicine men, tribal hunters, Shamans, and ritual leaders. This quite often symbolized leadership and a powerful connection to spirituality. I have always had a fascination with the practices of stretching piercings. The groups of people that i've talked about here are only a small portion of the people that have practiced this body art form in the past an of those who still do so to this day. My hopes are that more people will appreciate this amazing style of body modification and perhaps one day they too will give it a try!